Maybe even more. 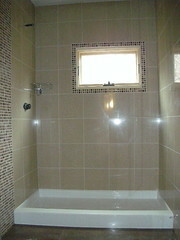 All tiling, grouting and caulking has been completed. The shower caddy went in the corner. The old mirrored cabinets went back in and look fantastic and the Tech Metro light is so awesome.